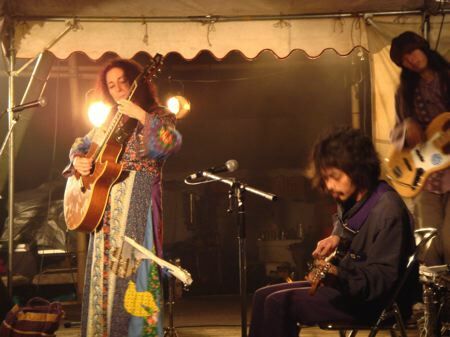 Alicia headlines at the Rainbow Festival, Aso Mountain, Kyushu Island, May 2007. That’s Futaro on lead guitar, and Daisuke on bass. I’m heading back to Japan April 9 for my third tour in less than 18 months. 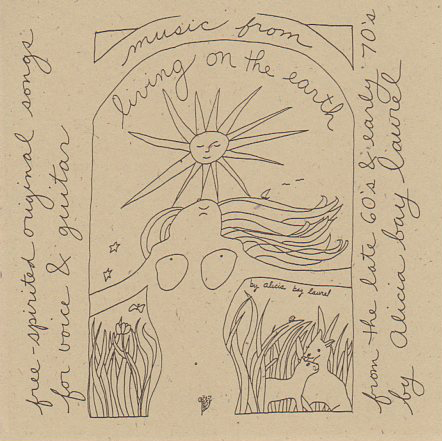 This time I’m having an art show of the original drawings from Living on the Earth, including the cover layout, displayed in handmade frames of sliced driftwood, crafted by Yuji Kamioka, who created the wooden signs at Kurkku Environmental Arts Center in Shibuya, Tokyo, where the exhibit will be held, May 10 to June 1. 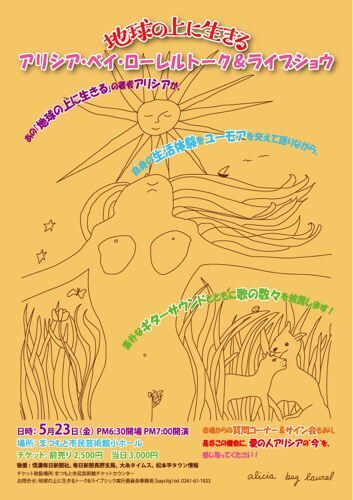 At the gallery opening May 9th, the beautiful women working at Kurkku will model the spring fashion line illustrated with drawings from Being of the Sun created by Aya Noguchi for Balcony and Bed. 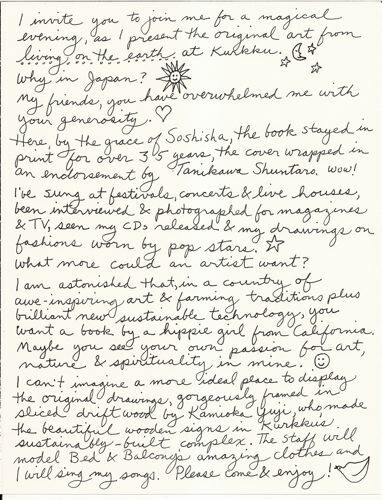 Other Tokyo locations where the drawings will be shown and sold will be the Balcony and Bed main store in the Daikanyama fashion district of Shibuya, and at Utrecht, a bookstore in Ginza. Hiroshi Eguchi, the owner of Utrecht, will be creating and publishing a catalog of the show. April 13 Rock on the Rock Festival in Hazu, just outside Nagoya, on the beach! April 20 Earth Day Festival in Saku, Nagano Prefecture. Festival site is near Sakudaira Station and adjacent to the Jusco Shopping Center. 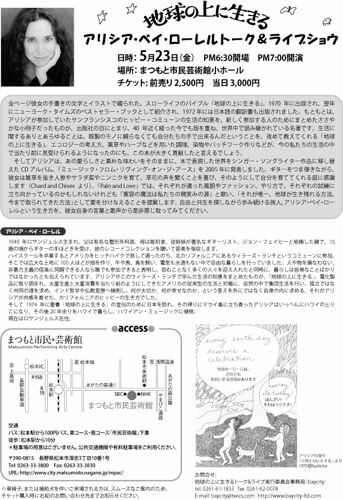 April 21 Cafe Gonza concert in Karuizawa, Nagano Prefecture, at 6:30 PM. 2000 yen. April 25 House concert in Ide, Nagano Prefecture, at 2 PM. 1000 yen. For more information, please call Kyoko and Ta-Bou at 0267-77-2485. April 26 3 PM Concert at Kuraya Greens in Kobuchizawa, Yamanashi prefecture. 1500 yen. For more info, phone 0551-36-4789 or call Asako Fujito at 080-6684-4477. May 3 Solo concert on Oshima, 5 PM at Alohana Gardens. May 9 Art opening party and concert 7 PM to 9 PM at Kurkku, Shibuya, Tokyo. Art show runs May 10 to June 1, 2008 in the Jingumae Lab at Kurkku. May 16 to 18 in Hakkakudo, Okinawa, spiritual, art and music retreat, co-lead by Sachiho Kudomi. Concert by Alicia and Amana on May 17. May 23 7 PM Solo concert, including my telling the story (with translation) of the creation of Living on the Earth, illustrated with projected photographs. Matsumoto Performing Arts Centre, Small Hall, 3-10-1 Fukashi, Matsumoto, Nagano 390-0815 Japan. Tickets 2500 yen pre-sale, 3000 yen at door. For tickets and information, please call Mayu at 0261-61-1833 or see the website she made for the event. May 24, 10 PM, Interview and music from the May 9th art opening concert on AP Bank Radio, Tokyo, broadcast all over Japan. I will fill in the exact times and locations of the events as I receive this information. My three CDs and two books will be available at all events, and I’ll sign (almost) anything you put in front of me, whether you bought it from me or not. Here are the front and back of the flier for the concert on May 23! 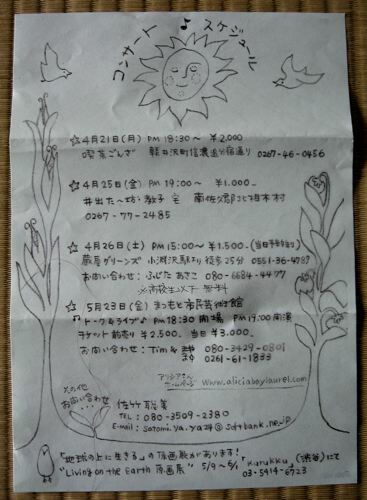 Flier for Nagano events, created by Satomi Yanagisawa, who is organizing the first four Nagano events for me. 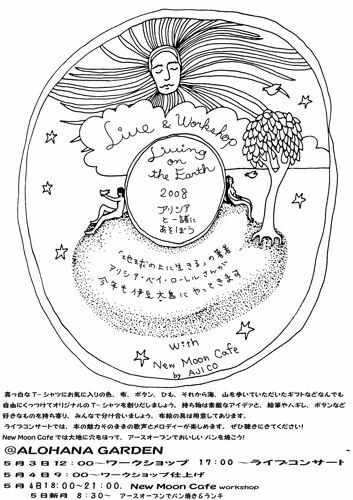 Flier for Dream Spirit Shirt making workshop and solo concert on Oshima Island, created by En Ando, my co-leader in the workshop. The drawing is from Being of the Sun.